Over at our good friends site www.thespoilingdeadfans.com, who have an excellent record with spoilers, they are posting, albeit unconfirmed reports of a major character death. If you do decide to read the information, let us know what you think in the comments and by voting in our poll below. We have some sad news to report today. First, we want to say up front that this is UNCONFIRMED INFORMATION. Repeat…UNCONFIRMED. This is something we are tracking right now and should not be taken as hard fact. Normally we wouldn’t even post, but the fandom is already talking about it and in light of the premiere we felt we needed to share what we knew. It seems as though we will be losing our favorite hat wearing, pudding eating, can’t stay in the house beloved Carl during the mid-season finale. Yes, it may be time to say goodbye to the one-eyed wunderkind. Now, before you start writing us nasty messages, let us tell you how we came to this conclusion. We get lots of information from everywhere, all the time. Most often they are just bits that don’t add up to something. Sometimes it’s even people trying to feed us false info to discredit us. But every now and then (remember Beth? Bob?) we get pieces of info that start to add up and form something true. It’s that thing where a couple pieces of the puzzle mean nothing, but start to piece them together and they form a picture. We believe that’s happening here. We received various pieces of information from separate sources beginning way back in early September telling us they believe Carl will die in the mid-season finale. We know the MSF will involve a huge battle at Alexandria with multiple fires, explosions and gunfire. There is plenty of photo evidence and eyewitness accounts of this. Separate sources also tell us that they believe Carl’s death was shot at the studio with corresponding scenes being shot at Alexandria near the gates. It is believed that he dies in the MSF with possibly his body being discovered and/or the aftermath of his death occurring in episode 9. So far there has been no corroboration in exactly how he dies; however, more than once we were told that he struggles with someone and is possibly stabbed. So what do we do with this? We go back and check the filming information and match it against what we’re being told. 1. A series of several night shoots in Alexandria begins on 7/29 for episode 8. Gunfire, yelling, explosions, fires, etc. 2. 7/31: Carl witnessed on the guard platform. Negan shows up. Carl gets down and goes to the gates. There is gunfire. Photo evidence confirms Carl’s presence. 3. 8/1: More night battle shoots. Carl is the only main cast confirmed filming. 4. 8/2: Most filming took place by Rick’s house. Late at night/early AM a couple of horrific screams were heard. At the time it was speculated that it was Michonne. Not confirmed. There is audio of the screams. 5. 8/3: Mystery day. Assuming studio. Nobody was sighted outside. 6. 8/4: More night shoots at studio. Andy Lincoln spotted near studio. 8. 8/21: Rick spotted near Alexandria gates briefly. Photo of crew trucks. 9. 8/ 22: Carl & Michonne filming at Alexandria. Morning studio filming. 10. 8/23–8/28: Alexandria filming. 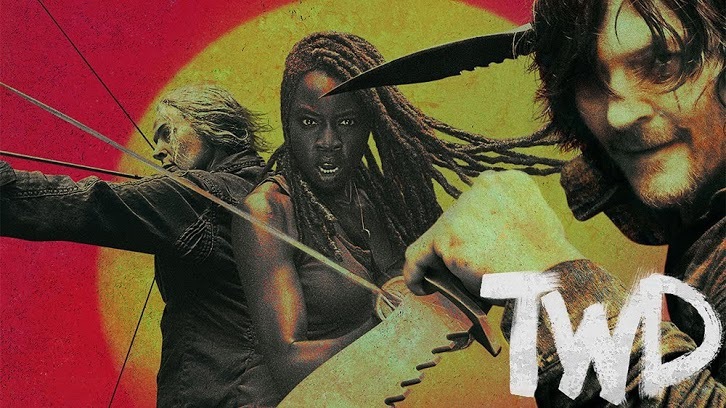 Carl, Negan, Michonne, Rick were confirmed via photo. 11. Chandler’s last reported filming was on 8/28 at the Gin property (Alexandria). This would be for episode 9. Eyewitnesses reported that Carl’s shirt was covered with blood and he was struggling with someone on the ground - unclear who. 12. By 8/29 filming shifted away from Alexandria to multiple sites. As of this date, no more Carl. Now let’s add in what we saw in the premiere. Again, we usually do not theorize, but this is too significant to ignore. In the premiere we saw two future Ricks: old man Rick and red-eyed Rick. We believe, as others do, that red-eyed Rick will be seen in a future episode and this is where he will be mourning the loss of Carl and make the decision to let “mercy prevail over [his] wrath.” Keep in mind that this is the quote uttered by the middle-eastern man at the gas station when Carl approaches. This is likely Siddiq from the comics (casting call corresponds with this theory). The fact that Rick utters this quote tells us that he will interact with Siddiq in the show and that this is, in fact, a scene from a future episode where Rick has suffered a tragic loss. There was significant foreshadowing in the future as far as Carl is concerned – his mercy toward “Siddiq” in providing him food. So there you have it. Take the info and decide for yourself what you want to believe. Our job is to report what we know and this is what we know. If true, we hate to lose Carl but Chandler Riggs has proven himself to be an asset to any cast and he has a bright future whether that means going on to college or going on to new projects. We’ll keep tracking this and will update you as new information comes to light.